After our sleigh ride and driving back from Sombrero Stables at Snow Mountain, CO I noticed a BNSF coal consist traveling south alongside Hwy 40 between the towns of Tabernash and Fraser, CO. I instructed Benjamin to take my Canon Digital Rebel camera from the Jansport backpack and start shooting as many pictures as possible as I slowed down to around 35 mph on the road back. I have added 19 images to the Blog header image rotation from this series and another 22 images into the general image folder for the PD site. 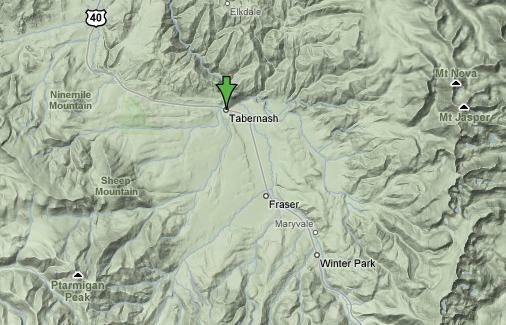 The towns of Tabernash and Fraser (el. 8,400 ft) sits in the valley between Ninemile Mountain (el. 9,695 ft), Sheep Mountain (el. 10,627 ft), and Ptarmigan Peak (el. 11,772 ft). This southbound unit coal train had two prime movers at the head, two in the middle of the consist, and a fifth unit at the end. At this elevation the grade averages 2-3%, and with a mile long coal cargo, this unit was moving at around 20 mph and kicking up a lot of snow along the way. It was an amazing sight to behold!